Last summer, Edelyn and Peter Yhip were preparing for the worst: If they were both convicted, they asked each other, who would take their children, 13-year-old Mikaela and 9-year-old Jonathan? What would happen to their home, and everything in it, if they were both in prison? But on August 23, after 6-1/2 years of accusations, the Yhips stood in court and heard the judge drop charges against them, because the state had conceded it had insufficient evidence of murder in the 2012 death of Jonathan’s twin brother Benjamin. In a television interview in the fall, Mikaela remembered how police officers came to her school one afternoon and took her and Jonathan away from the family friend who’d come to pick them up—leaving them instead in the care of foster parents they’d never met before. “They told me that Benjamin died,” Mikaela recalled. “I was so confused and scared… I really missed my parents, especially at night.” She was 7 years old. The Yhips were eventually able to transfer the foster placement to a family the children knew, but even then they were allowed only an hour and half a week of visitation, always supervised by social services—”It was like somebody was spying on us all the time,” is how Mikaela put it. Jonathan was not allowed to attend his brother’s funeral. They quickly realized, though, that Benjamin had serious medical problems, with recurring infections and a diagnosis of failure to thrive that led to an implanted feeding tube. In the spring of 2012, Edelyn found him not breathing in his bedroom and called 911. 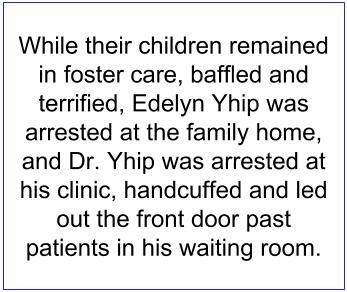 While their children remained in foster care, baffled and terrified, Edelyn Yhip was arrested at the family home, and Dr. Yhip was arrested at his clinic, handcuffed and led out the front door past patients in the waiting room. The Yhips’ friends and family rallied behind them, setting up a web site and raising money to mount a defense. More than one family put their homes on the line, adding their properties to the bond, so Edelyn and Peter could be out of prison while waiting for trial. The family was reunited about a year after the accusations, when the dependency court found “substantial evidence” that Benjamin had died of medical complications, not criminal assault. Still, the county continued to press its criminal case for five more years, while the NCIP submitted a growing body of medical reports supporting the family’s innocence, as well as court decisions from other disputed shaking cases and the 2018 book, The Forensic Unreliability of the Shaken Baby Syndrome. This week, the Yhips are heading to Atlanta for the annual Innocence Network conference, April 12–13, where they are hoping to connect with other accused and exonerated families. You can contact them at fresh20fishing@gmail.com. If you are not familiar with the debate surrounding shaken baby syndrome, please see the home page of this blog.